Claviceps purpurea: Beauty or Beast? Claviceps purpurea is an ascomycete fungus that has affected the human race, in both good and bad ways, for perhaps over 1000 years (Lee 2009). Some have called it the Pandora’s box: sometimes showing a beauty, capable of great benefit and sometimes showing a beast, causing pain and misery. Claviceps purpurea is an ergot fungus that infects various grasses (Kren et al. 1990). Historically, rye was commonly infected, but wheat, rye, barley, oats, brome, fescue, and other grasses can also be infected (Menzies et al. 2014). Environmental conditions associated with a cool wet spring followed by hot early summer temperatures are ideal for this ergot fungus to grow (Menzies et al. 2014). Delayed harvesting of grass hay because of rain also means that late cut hay may also be at risk of ergot infection. The hay could then pass on the infection to crops grown for human consumption (Menzies et al. 2014). The fungus proliferates by releasing its spores, which are then carried away by wind currents (Dung et al. 2017). These spores can be carried over large distances and easily infect other grasses and crops in distant fields (Dung et al. 2017). 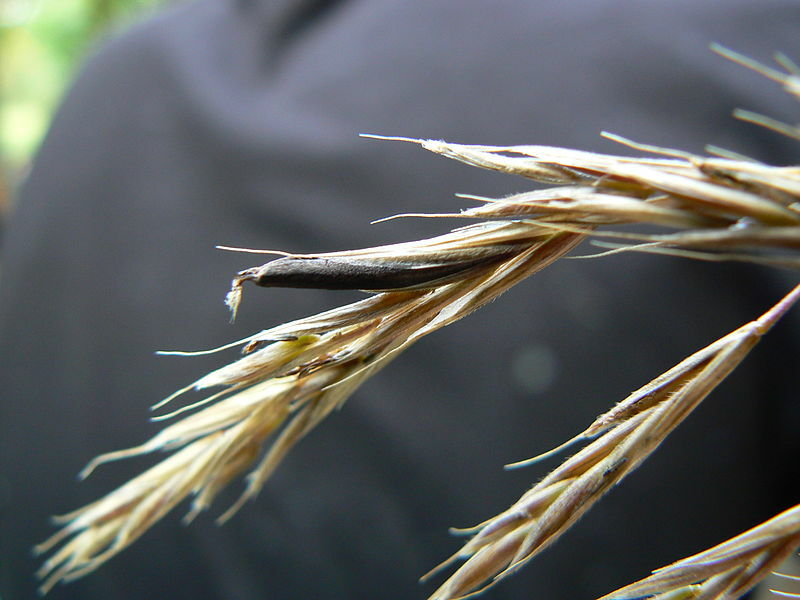 An ergot kernel develops when a floret of flowering grass is infected by a spore of C. purpurea (Luttrell 1980). The infection process behaves similarly to a pollen grain growing into an ovary during fertilization (Luttrell 1980). The infected grain then grows into a sclerotium, a hard dark resting body capable of remaining dormant for long periods. It will eventually drop to the ground to await good conditions for its fruiting phase, after which it will spread on to other grasses and continue its lifecycle (Luttrell 1980). The consumption of a plant infected with C. purpurea can have terrible consequences. The fungus, producing toxic compounds that are vasoactive, can cause severe vasoconstriction of small arteries (Eadie 2003). The extremities (fingers, toes, hands and feet) can be affected, which can cause loss of the tips of fingers and toes. This type of infection is referred to as gangrenous ergotism (Ergotismus gangraenosus) (Eadie 2003). Another type of ergotism, also caused by eating the infected grain, is referred to as convulsive ergotism (Ergotismus convulsivus), this type is characterized by paranoia and hallucinations, twitches and spasms (Eadie 2003). There is evidence that suggests that convulsive ergotism may have initiated the witchcraft delusion in Salem, Massachusetts, in 1692 (Caporael 1976). What created this witch delusion was a group of young girls claiming to be possessed by the devil and then several local women being accused of witchcraft (Hill 1995). As a wave of hysteria spread throughout the colonial area, a special court convened in Salem to hear the cases (Hill 1995). During these witch trials no explanations could be given, other than witchcraft, that could explain why multiple, up standing, people could all have such strange behavior occurring in the same time period (Hill 1995). The behavior of the people in question at the witchcraft trial, was characterized by disorderly speech, odd postures and gestures, and convulsive fits. These behaviors are very similar to people suffering from convulsive ergotism (Caporael 1976). At the same time of the trials, rye was established and the conditions were right for ergot infection (Caporael 1976). You can see how in a time of limited understanding people could misconstrue symptoms of convulsive ergotism for something otherworldly, a beast if you will. Now having a look at the other side of the coin, it has been discovered that C. purpurea can be a beautiful thing, providing us with medicine to treat certain ailments. Ergot alkaloids can be used for the treatment of many ailments, one of which is migraines (Schiff 2006). Drugs, such as dihydroergotamine and ergotamine, use ergot for the relief or prevention of vascular headaches, such as migraine, migraine variant and cluster headache (Antonaci 2009). However, these ergot drugs are no ordinary pain relievers; they will not relieve any kind of pain other than throbbing headaches. This is due to the fact that ergot alkaloids specifically act to constrict intracranial blood vessels and inhibit the development of neurogenic inflammation (Antonaci 2009). In today’s medicine ergot alkaloids are widely used, but they are used with caution. Avihingsanon et al. describe a case study where a woman, while on an antiretroviral regimen involving several medications, took ergrotamine and developed gangrenous ergotism as a result of combining medications. Many cases have been described where ergotism has developed as a result of combining various drugs with some type of ergot medicine (Avihingsanon 2014). An onset of ergotism can also be found in people that have been taking ergot medication for prolonged periods of time (Avihingsanon 2014). From this it must be realized that when we court the beauty we must be careful not to awaken the beast. In conclusion, it can be said that Claviceps purpurea is a beauty and a beast, sometimes you can see one side or the other. At other times, as is the truth about most things, these two personas can merge into one. Through the eyes of modern science it is now possible to see that the beast can be beautiful and the beautiful can be a beast.